Climate change is forcing Maine gardeners to adapt to changing conditions. Among those adaptations, raised beds allow for better soil conditioning and drainage, something important as the area continues to experience more intense bouts of rain during the growing season. Hammon Buck has been working with Maine gardeners for more than half a century, and in those five decades he’s seen what a warming trend and climate change are doing to the region’s growing seasons. Buck is not alone in noticing things are changing in accordance with a continued climate shift. In recognition of the impact climate change is having on planting, in 2012 the USDA released an updated version of its plant hardiness zone map, which is used by gardeners to determine what flowers, fruits or vegetables grow best in their particular region — or zone. It’s previous map was released in 1990. 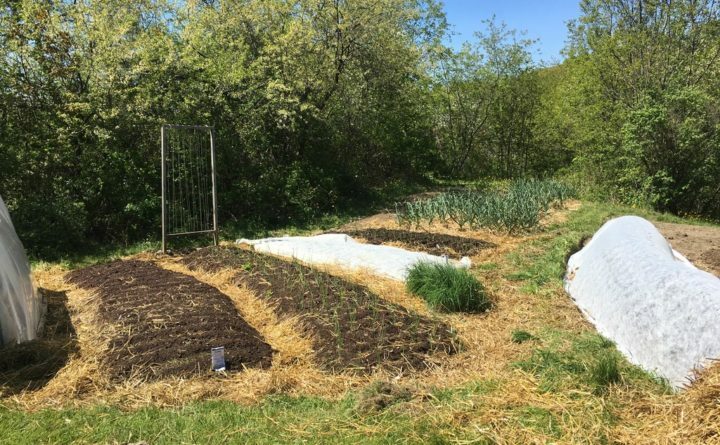 What this means to those who plant in Maine, according to climate change experts, is the state’s growing seasons have lengthened, allowing for the introduction of newer crops. But as helpful as a longer season could be for growing plants and food in Maine, Jemison said it also comes at a cost. According to the University of Maine Climate and Agriculture Network, the average length of Maine’s frost-free growing season is currently 12 to 14 days longer than it was in 1930 and is expected to continue to increase by 2 to 3 days per decade. Along with this, the minimum winter temperatures in Maine are increasing a rate faster than the daily highs in the other seasons. With warmer winters, according to the climate network, Maine is also in store for more frequent and intense heat waves during which the feel-like temperature will break 95-degrees. With the predicted added risk of heatwaves comes more frequent and extreme downpours, according to the agriculture and climate network. The network’s data shows the frequency of extreme precipitation events in Maine increased 74 percent between 1948 and 2011. Intense storms that used to hit around every 12 months are now occurring every seven months with the maximum hourly rate of precipitation increasing around 35 percent between 2001 and 2013. The network predicts the frequency and intensity of these extreme weather events will continue over the coming decades bringing risks of increased soil erosion, seed loss, flooding and nutrient runoff. Koehler, who works with Maine’s fruit tree growers, said his farmers have observed the annual rainfall in the state creeping up, but not in a manner beneficial to their crops. In fact, supplemental watering has become more important at Johnny’s Seeds, according to Zuck. As far as home gardening is concerned, Jemison, who has been gardening in Maine for 25 years, said planters need to be prepared for these sporadic rains that he said seem to be creating wetter spring months in Maine. Climate change, he said, is only going to exacerbate plant diseases and pest issues and he said the best way for the home gardener to battle that is practicing the best gardening possible. Building organic material into the soil also helps with supplying important nutrients to plants and with proper water drainage, Jemison said. Jemison also suggests creating methods to capture and store rainwater for use during dry periods. Gardeners may be tempted to start planting as soon as the weather seems warmer, but Jemison cautions against going all in with what seems to be early springs. If someone is determined to get that early outside planting start, Jemison recommends planting things that are easily and inexpensively re-planted like greens, instead of more costly things like fruit trees. When it comes to what to plant, Buck, whose business celebrates its 40th anniversary this year, recommends sticking with what has worked in the psat, despite what zone changes may have occurred in Maine, or at least doing some homework before planting. The key, he said, is to find out if the seed has been thoroughly tested.